After the first group of volunteers left, me and my friend Alice had a week off before the next group of volunteers arrived. We moved from the hostel we were staying in, to Katie & Jeno’s house in the village. This was this first time I’d stayed in the village, as we usually stay in a hostel in town where there is enough room for all the volunteers. It was quite surreal staying there after going so many times for just few hours at a time. We decided to teach the older boys who have been helping the English volunteers run the camps for several years now. When we first met the boys they were 14/15 and now they are between 15-18. It’s been really strange seeing them grow up and change every time we see them (one of the lads is now married and living with his wife!). Being a teenager in the village is difficult, there is very little for them to do and without support from their parents there is nobody to drill in the importance of getting an education to them. Three of the boys have now dropped out of school and have very limited options available to them. In the four days we had spare me and Alice took them out of the village for a couple of days to teach them a little bit of English. For our first English lesson we took the four lads, Lapi, Vergin, Gyozo and Feri to a beer garden and played pool to break the ice as we wanted it to be relaxed. We tried getting them to only speak English but that didn’t work very well whilst playing pool! So decided to go back to ‘proper’ teaching and gave them all a pad of paper and pens. It was great to see them writing and really taking care. Gyozo ripped up his piece of paper about 5 times as it wasn’t neat enough for him! The walk back to the village was the highlight of the day. The lads had got confidence in speaking English at this point. Everything we passed we pointed at and told them the word in English and practised what we'd taught them already - sit down, stand up etc. It was amusing them suddenly stopping or sitting when we said something! What was even better was Gyozo shouting ‘What’s the problem’ across the street at a stranger. Luckily not many people speak English in Tirgu Mures (or don’t let on that they do anyway!). The next few days of teaching them went well. I tried out my skills as a TEFL teacher and made little cards and got them to match them up to make sentences. It was going well until a gust of wind blew them all off the table! Despite trying our best to get them speaking in English it was conversations about girls, drinking or smoking that got them all talking – typical lads! It was great to see them taking in an interest in learning and even though we might not have taught them as much as we’d like, it’s more than they knew before and got them more confident in speaking English. Lapi and Vergin the older two lads, knew a bit of English but would never speak it so that was progress in itself! Vergin was even reading his notes on the walk down into town one day, which was really nice to see, as he'd been one of the quieter ones on the first day and we weren't sure if he'd return for day 2! 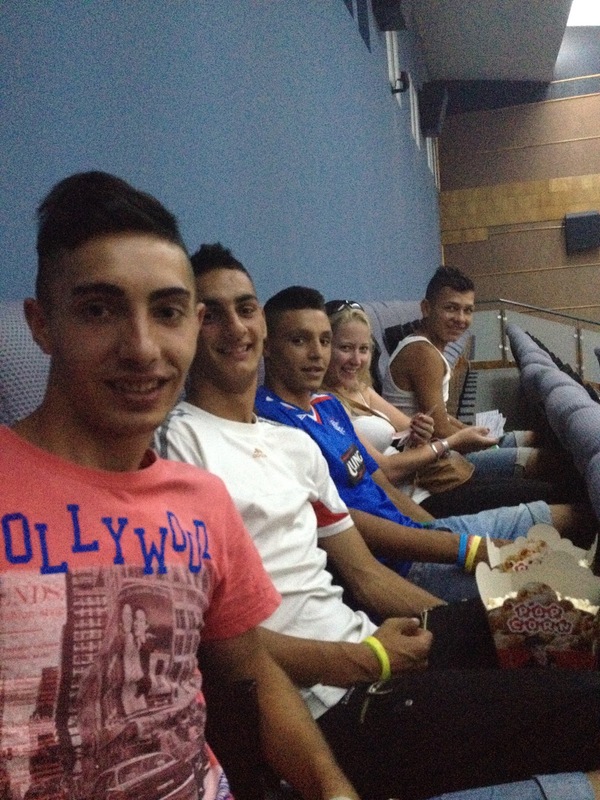 For our last lesson we took them to see Batman in English with Romanian subtitles. I don’t think they had ever been to the cinema before. It’s little things like that, which we take for granted in the UK but it’s a real treat to them. Felt like such a mum buying them popcorn and drinks. We asked them if they enjoyed it and Gyozo looked really annoyed, he said he didn’t like it because Batman died so when we told him he didn’t he decided he did like it after all! Me and Alice booked a couple of days in Budapest. After we booked it we realized there was a big festival, the Sziget festival on at the same time so we decided to go to that while we were there. I got a really cheap deal on a 5 star hotel, which was actually cheaper than most hostels so we couldn’t pass up on the opportunity! We enjoyed the 5 star luxury and all the touristy things around Budapest before heading to the festival. If you’re ever in Budapest Sziget festival is a must. Good bands, cheap beer, great location and a lack of festival idiots – what’s not to like?! After a horrendous plane journey back (see cheap beer reference and above pictures), we returned to the village for a day to relax before the second group of volunteers arrived. The second summer camp is the one I usually come for. The same kids go on the camp until they get too old and I've looked after the same boys for three years now. As soon as I saw them in the village they told me who else was going to be in our cabin this year!